Please read the HID 101 section for a brief overview of the pros and cons of HID systems, as well as types of HID conversions available. "How many stock different headlights are there for the Focus?" "I keep hearing about ST-170 or MK-II or European Focus lights. I'm lost!" 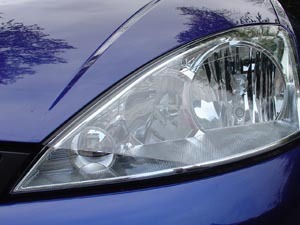 2000 to 2004 North American Focus models only had one major style of headlight - a single halogen beam light with a reflective housing: The only real difference is the treatment of the light housing. European Focus models many different styles of headlights, depending on the model year. From 1999 to 2001, the European Focus had a similar design to that offered on the 2000 to 2002 North American car. 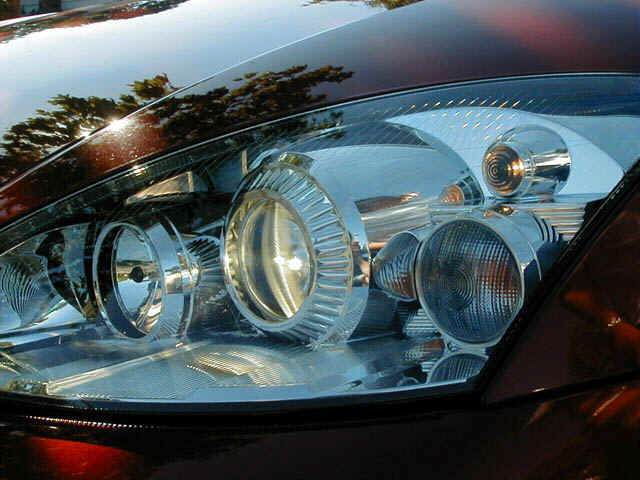 In 2002, headlights went to a dual halogen light set-up with a signal indicator built into the housing. The headlight design depended on the vehicle. It's also important to note that the "Mach/SVT HIDs" were also available in Europe. These were designed to meet European transportation standards (more below). "What are the part numbers?" 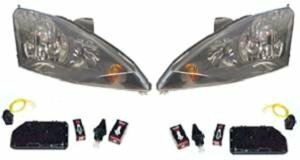 This kit fits 2000 to 2004 Focus, and states it's optional equipment on the SVT Focus (it leaves out the first Focus these lights were available, the Mach Edition ZTS). Please note that the Ford Racing kit is for Off Road Use Only. You can also order the parts separately, but it is highly recommended you use the Ford Racing kit because the wiring has been developed by engineers at Ford Racing/SVT. If you need a part listing because you performed the "hacked" conversion, please visit Step 1 of the Hacked Conversion Process. Note: We have heard rumours that Ford Racing will discontinue the H.I.D. Headlamp Kit. If you're on the fence in wanting this kit, now is the time to buy it before they are sold out! "How much are these lights?" Check with your local Ford or Ford Racing Performance Parts dealer for the latest pricing. Pricing has varied considerably since the introduction of these lights in 2002. Since November 4, 2002, the Ford parts have experienced a drastic price increase. Please contact your local Ford dealer for the latest list price. The Volkswagen wires and connectors have also apparently experienced a price increase. Please contact your local Volkswagen dealer for the latest list price. "Why are these lights so expensive?" "Where can I get the cheapest set?" Generally, your local Ford, Lincoln, Mercury dealership will charge list prices on parts. Authorized Ford Racing dealers may sell at the suggested retail price, but that depends on the distribution network in place. There are numerous Ford-based parts warehouses on the Internet that sell for less, compared to traditional Ford Parts Counters. Some Focus enthusiast forums are sponsored by Ford dealers. If you are part of SVTOA, various Dealer Sponsors and National Sponsors may offer discounts. Check why membership has its privileges. You can also try eBay and/or Classified Sections of Focus enthusiast sites. "What's this about European HID's for the Focus" Ford of Europe also introduced HID headlights on European Foci around the same time they were made available in the US. The European HID's were offered as an option on the ST-170 (think of a European twin of the North American SVT Focus) and other Focus models (either as a standalone option or special edition package). "Can I use the European Focus' HID lighting system on my North American Focus?" European HIDs are built to E-code specs (an agreement between numerous countries in Europe). The Mach Edition/SVT HIDs are designed to meet US Department of Transportation (DOT) standards. European lights conform to E-code specs (an agreement on lighting standards set between European countries). Transport Canada does allow for the use of E-spec. However, E-spec is deemed illegal for use in the United States because they do not conform to DOT standards. So, the use of European Focus HID's in a North American Focus can be illegal or legal, depending on where you live. Lights for the European market are designed to which side the driver's sit. Any use of European lights for North America will mean you need a left-hand-drive (LHD) specific system. You cannot use a right-hand-drive (RHD) system in a North American car because the light cutoffs will be drastically different and affect your nighttime visibility and safety. "Can I use the Mach/SVT HID lights in Europe?" The Mach Edition/SVT HIDs are designed for left-hand drive (LHD), North American vehicles. They are not designed for right-hand drive (RHD) Foci. The Mach Edition/SVT HIDs are designed to meet US Department of Transportation (DOT) standards, so they do not meet E-code specs. In some European countries, local, regional, state/provincial, and/or federal authorities require additional equipment when retrofitting your vehicle with an HID lighting system, such as adjustable light beam levelling and headlamp washers. Check with regulators to see what you need to do to make your vehicle compliant. "How long do HID bulbs last? " True xenon bulbs do not have a traditional filament. Theoretically, it should last the life of the car. "If Ford is the one that makes these lights (and I'm sure they know they are selling alot of them), why don't they make a harness that eliminates the need for all the soldering and splicing of wires? It seems to me that there should be a kit for this conversion." A complete harness is included with the kit available through Ford Racing. At this time, it is unknown whether you can purchase the wiring adapters separately from Ford Racing. "I can't get these lights in Canada." With the introduction of the kit from Ford Racing, you can order the kit through your local authorized Ford Racing dealer. Barring that, you will have to source these lights from the United States and/or through the Internet on Focus enthusiast sites and eBay. Please note it is not currently possible to obtain the lights separately from the parts depots across Canada. "I currently have a set of ST-170 or MK-II European Focus headlights. How do I convert to HIDs? Do I need any additional materials? You're already halfway there. This modification already uses the same "VW connector" used in the MK-II and ST-170 headlight modifications. All you need is additional wiring to accomodate the additional ground wire and city light (if you did not originally put in the city light). That, and you'll need the light housings as well. Do not attempt to retrofit the light housings to accept an HID system. Please read our HID 101 section for information. "Will my Ford, Lincoln, Mercury dealer install my HIDs for me?" Some dealerships have installed the HID lights for good customer relations. Labour rates will vary. Some, however, may not do the install as it's a major modification that could void your bumper-to-bumper warranty and bring forth legal action onto themselves. The lights are relatively easy to install. It shouldn't take a novice more than a few hours to complete the task. "Can I use a set of European HID lights for the Focus in my North American Focus, or vice versa?" "I see other HID-equipped vehicles (e.g. BMW, Nissan/Infiniti, Lexus, etc.) and feel their lights are more 'blue', compared to the Focus." "The stock Philips D2S bulbs that come in the Machs are the brightest you can possibly have at 4100K. Anything higher up the kelvin scale will produce more color but also become dimmer. The Mach HID headlamps come with newer generation Hella ballasts and ignitors, which are supposed to be more stable, reliable and efficient than the older type ballasts. Another option for the Machs is to upgrade the bulbs to Philips Ultinon Cool Power Xenon D2S, but these have less lumens than the stock Philips Hid and are rated at 2400lm at 6000k color. 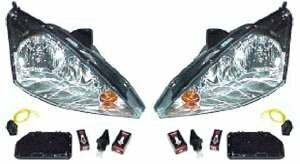 They are expensive (about $300 a pair) and are meant to rid some of the yellow light emitting coming from some xenon headlamps. It's more show than go, in terms of lighting performance. There are also the cheaper, non-OEM supplier 4100k and 6000k-10000k D2S HID bulbs sold on eBay and other shops. For what its worth they will probably not last very long. I know because I have tried them as well as many cheap HID kits. Projector design also influence light output...the best out there are the Valeo projectors on the Audi S4 and also the RS6. These projectors produce a very, very sharp cut-off, wide beam pattern and impressive light output." Also, as it is still unclear as to any long-term damage coming from the retro-fit, the last thing you need to do is melt some very expensive headlights and all the associated wiring. "After seeing the "blacked out" treatment of the ST-170 lights, I want to do the same to the HIDs." A few individuals on Focus enthusiast sites have already "blacked out" their HID light housings. It requires separating the clear lens from the housing, painting the "chrome" sections, and re-attaching the lens and housing. Check out our Modifications/Customization section. "Is there a way of getting more light from the Mach HIDs?" There is a method involving removing a shield found inside the headlight housing. Please refer to our Modifications/Customization page for more information. "Where can I get matching fog lights?" One of the things you will notice immediately with the HID conversion is how "yellow" the stock fog lights are on the Focus. For some, a remedy has been to use aftermarket bulbs that either advertise a higher wattage and/or a whiter light. Please note the jury is out whether this creates a problem for the Focus. Some people have had no problems with upgraded bulbs. Other folks have had their fog light wiring harnesses and/or housings melt with a whiter bulb. "I want to do more!" There are a lot of other customization ideas out there. Given the amount of enthusiasts out there, someone may have some valuable tips on how you should proceed or give you additional details. Check out our Communities section to see how far you can take your Focus.